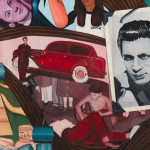 This Day in History – May 20, 1942: “S.F. Clear of All But 6 Sick Japs” – ¡Murales Rebeldes! 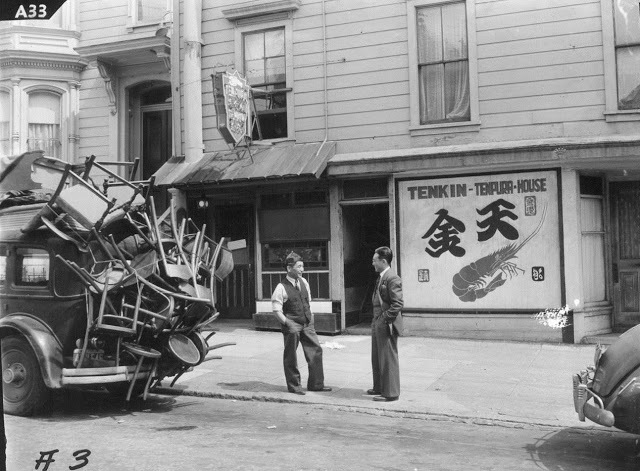 Clem Albers (Photographer), Evidence of the Forthcoming Evacuation of Residents of Japanese Ancestry, San Francisco, March 29, 1942. Courtesy The Bancroft Library. From May 1942 to January 1945, in the name of national security, nearly 120,000 West Coast residents of Japanese ancestry occupied ten permanent camps in isolated inland areas for the duration of World War II. Their forced evacuations and relocations following the bombing of Pearl Harbor were not secret: there was much controversy over the government’s action, and a number of photographers officially documented the event. 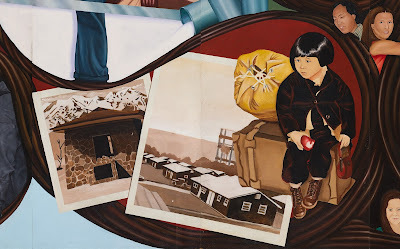 Nevertheless, it was not until the 1970s that individuals and institutions—within and outside Japanese American communities, where they were a source of shame—began to open a wider window into this egregious chapter of American history. Under contract by the War Relocation Authority’s Information Division, San Francisco Chronicle press photographer Clem Albers photographed the incarceration of Japanese Americans, primarily in northern to southern California. 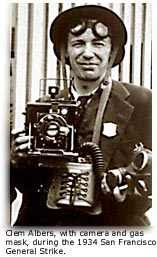 From March to late April/early May 1942, with his 4-by-5-inch Speed Graphic press camera, he documented relocations to and arrivals at Manzanar, Tule Lake, and Poston camps. After his brief assignment, he was a warrant officer at the U.S. Maritime Service, returning to his job with the San Francisco Chronicle after the war. 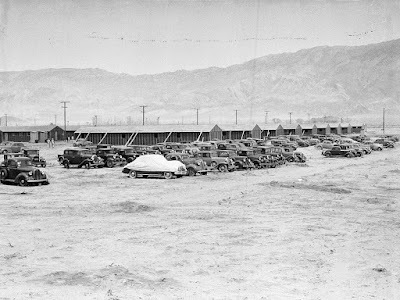 Clem Albers, Impounded Japanese American automobiles, Manzanar Relocation Center, April 1942. Courtesy National Archives and Records Administration. 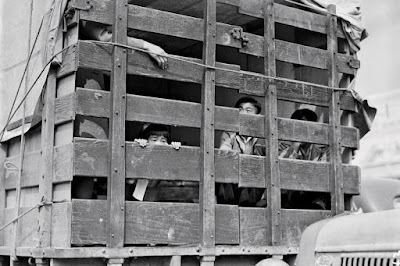 Clem Albers, A truck packed with Japanese American residents of San Pedro, California, leaves for a temporary detention center, April 5, 1942. Courtesy extranewsfeed.com. Clem Albers, While military police stand guard, this detachment watches arrival of evacuees at Manzanar War Relocation Authority center, April 2, 1942. Courtesy The Bancroft Library. 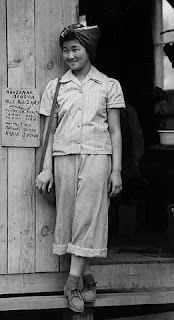 Clem Albers, Manzanar, Calif.—In the doorway of her barrack apartment at this War Relocation Authority center for evacuees of Japanese ancestry, 1942. Courtesy National Archives and Records Administration. As we now know, the U.S. government impounded not only cars of Japanese families, but also photographs taken of the incarcerations, such as the military’s oversight of camps and residents. As the New York Times has observed, “Photographs of barbed wire, machine gun-wielding guards or dissent within the camps were forbidden . 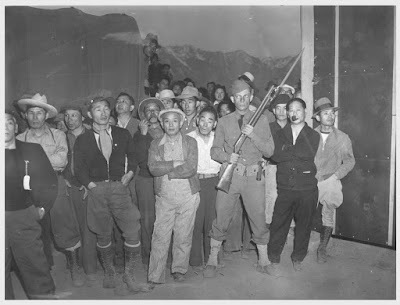 . . photographs of resiliency and civic engagement in the camps were encouraged.” And as Karen J. Leong notes, “particularly those depicting the reality of armed guards supervising the evacuees” were censored. Such images by Albers and other internment photographers, notably Dorothea Lange, were reviewed by military commanders and branded “Impounded.” Housed at the National Archives, where they were rediscovered only in the last decade, they have lost their restricted status. 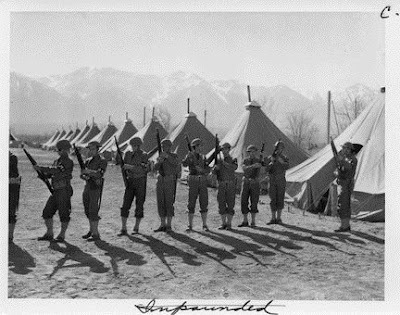 Clem Albers, Military police officers checking their weapons at Manzanar Relocation Center, c. 1942. Courtesy National Archives and Records Administration. 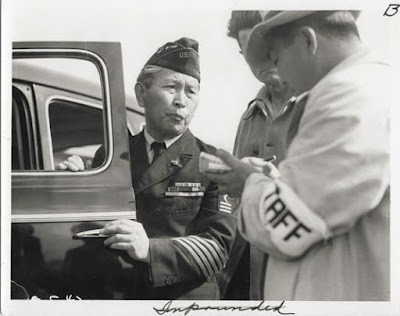 Clem Albers, Dressed in uniform marking service in the First World War, this veteran enters Santa Anita assembly center for persons of Japanese ancestry evacuated from the West Coast, 1942. Courtesy National Archives and Records Administration. Today, internment photography continues to have wide-ranging impact: from connections made between the internment and the current administration’s call for Muslim bans and registries, to studies about prison photography, to representations by contemporary artists of minority populations and their roles in the histories of communities, cities, and nations. One example is Albers’ haunting and perhaps most iconic image depicting the mass relocations of Japanese Americans in Southern California. 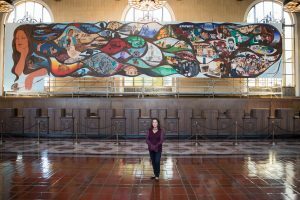 His 1942 photograph of two-year-old Yukiko Okinaga Hayakawa awaiting evacuation at Union Station in Los Angeles found relevance nearly forty years later in L.A. History: A Mexican Perspective (1981), a mural by Chicana artist Barbara Carrasco. 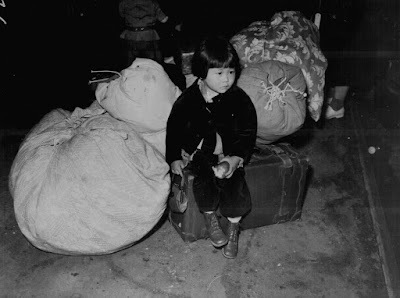 Clem Albers, A young evacuee of Japanese ancestry waits with the family baggage before leaving by bus for an assembly center, April 1942. Courtesy National Archives and Records Administration. 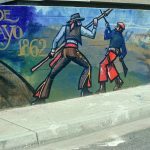 Ironically, Carrasco’s mural, featuring scenes of the marginalization of Los Angeles’s minorities among more celebratory historic events, itself was censored. Objections to less laudable depictions of the city’s history were, perhaps, unwelcome during Los Angeles’s bicentennial (1981) and Summer Olympic (1984) festivities. 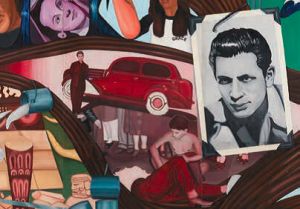 Mural detail, Barbara Carrasco, L.A. History: A Mexican Perspective, 1981 (Censored 1981). 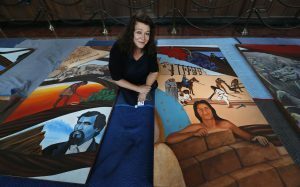 Courtesy California Historical Society/LA Plaza de Cultura y Artes; photo: Sean Meredith. At a press conference on October 20, 1942, President Franklin D. Roosevelt called relocation centers “concentration camps,” despite the War Relocation Authority’s denial of the term’s accuracy. Seventy-five years later, we have come full circle.